On Thursday, President Obama issued a long overdue statement calling for regime change in Syria, declaring that the “time has come for President Bashar Assad to step aside.” But will that call to action amount to anything in practice? The gestures that Obama has made, including ending the U.S. import of Syrian petroleum products—totaling some 6,000 barrels per day—are little more than symbolic changes of policy. On the other hand, though the use of military force hasn’t been explicitly removed from the table, it’s clear that the American government—not to mention the American public—has little appetite for another war in the Middle East. Fortunately, there are plenty of policies that the United States could pursue, short of dropping bombs on Damascus, to hasten Assad’s fall. Even better, there’s no need to wait before implementing them. Damascus is currently bankrolling its brutal crackdown by exporting the vast majority of its 150,000 barrels of oil per day to Europe, generating an estimated $7 to 8 million per day for Assad. If the United States were to be joined in its energy sanctions by the EU—which appears to be the direction in which EU officials are moving—it would prove a significant blow to the Syrian government. Even these joint sanctions, however, would likely prove insufficient on their own. Without its proceeds from oil exports—which account for 30 percent of state revenues—the regime would be forced to burn more quickly through the $17 billion in foreign reserves it started with at the beginning of the revolt. But this process, according to some estimates, could take at least a year, and with the atrocities showing no sign of abating, that sort of time frame is simply too long. Worse still, there is no guarantee that these measures—even in place for years—would be successful in bankrupting and dislodging the regime. For example, Saddam Hussein’s Iraq was sanctioned by the UN in 1990 following the country’s invasion of Kuwait. These sanctions—and, later, the UN “Oil for Food” program—endured until U.S. forces toppled the regime in 2003. Energy sanctions, in other words, are perhaps the best arrow in the U.S. policy quiver, but, to mix metaphors, they are not a silver bullet. To help hasten Assad’s demise, Washington should take additional measures, in tandem with Europe, to increase the pressures on the regime. To begin, the EU is amenable to broadening its sanctions regime to other institutions and areas of the economy. It will be incumbent on the Obama administration to push the envelope on this front, convincing the EU to also adopt a ban on investment in Syria, particularly in the energy sector, where European companies dominate the market. In addition, when it comes to aiding the Syrian opposition, the Obama administration should elevate and routinize its contacts with key leaders in the movement, both at home and abroad. If asked, Washington should assist the opposition to better organize its ranks, as well as to develop a publicly articulated vision for Syria’s future that is tolerant, pluralist, and democratic. U.S. support for the opposition might also include the provision of modest funding for Thuraya satellite phones, which can help regime opponents on the ground in Syria to better communicate with each other and with the outside world. At the same time, to demonstrate the U.S. commitment to Syria’s future, President Obama himself should consider an Oval Office meeting (and photo op) with respected Syrian opposition figures. Towards the Syrian regime, meanwhile, the administration should establish a declaratory policy targeting the Syrian military in order to encourage more desertions. The message from Obama should be that Syrian military officers will be held accountable for war crimes committed against the Syrian people. Within the United Nations, the administration should move forward on a broad range of initiatives, including pressing the U.N. Security Council to level sanctions against Syria for the regime’s ongoing violation of its commitments to the International Atomic Energy Agency. While China and Russia may be loathe to sanction the Assad regime for its human rights violations (Russia this week announced it would continue to sell weapons to Syria), they might prove more amenable to abstaining from—rather than vetoing—a resolution hitting Damascus for its efforts develop nuclear weapons. The administration’s best potential source of leverage against the Assad regime, however, resides in the Middle East. The Gulf States—and Qatar, in particular—have been an important source of foreign direct investment in Syria in recent years. Washington should work with its Gulf allies to ensure that that spigot is turned off. (Since April, Qatar, promisingly, has been featuring the Syrian opposition and its officials on the air on Al Jazeera). Most important, in this regard, is swaying Syria’s immediate neighbors, all of which have complicated relationships with the Assad regime. The key here is Turkey, Syria’s powerful neighbor to the north. The Islamist government in Ankara, led by Prime Minister Recep Tayyip Erdogan, has ongoing contact with Assad, with the Turkish foreign minister visiting Damascus earlier this week. And judging from the ultimatum issued by Turkey—giving Assad two weeks to end military operations—Ankara appears to be reaching the end of its rope. 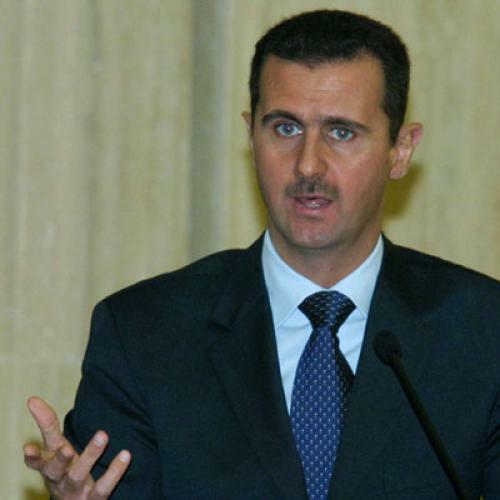 Particularly problematic and embarrassing for the Turkish government is that the Alawite Assad regime, which many Muslims consider to be heterodox, is slaughtering Sunni Muslims during the holy month of Ramadan. If Turkey joins the growing coalition of states that have written off the Assad regime—and also levies sanctions—it would undermine support for the regime among the country’s Sunni business elite, a critical pillar of regime stability. Regrettably, relations between Washington and Turkey are not what they once were. Although Turkey is a NATO partner, it is an increasingly distant friend of the United States, and one over which the U.S. has not been able to exert a great deal of influence in recent years. But that doesn’t mean that Obama shouldn’t make every effort to bring Ankara in line with the growing international consensus on the Assad regime. Turkey’s support for a Syrian-engineered regime change would compliment and amplify U.S. and EU measures. It’s true that the United States, and its international partners, will only be able increase their pressure on the Assad regime incrementally. But for the Syrian people, incremental change is much preferable to no change at all.